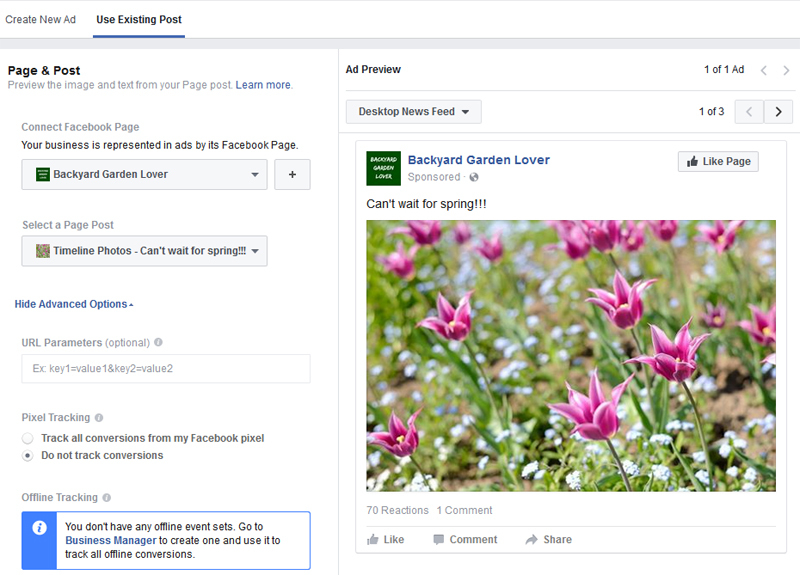 Let’s look at how to set up a great Facebook ad that won’t cost you an arm and a leg. I usually start with an existing post that’s doing well organically. What does that mean? It depends on your niche. 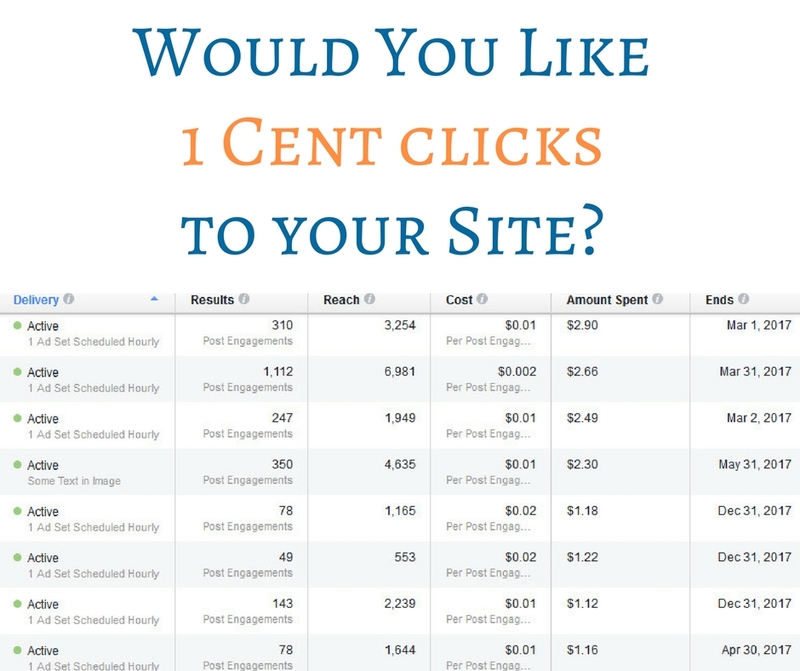 I have FB pages in 2 niches, and my posts on both hover between 3.5% and 5%, with some a lot lower and an occasional 7%. To get started, go to the ads manager here. On the top right corner, you’ll see a green button that says “Create ad”. Click on that and you’ll be taken to a screen where you’ll choose your campaign objective. 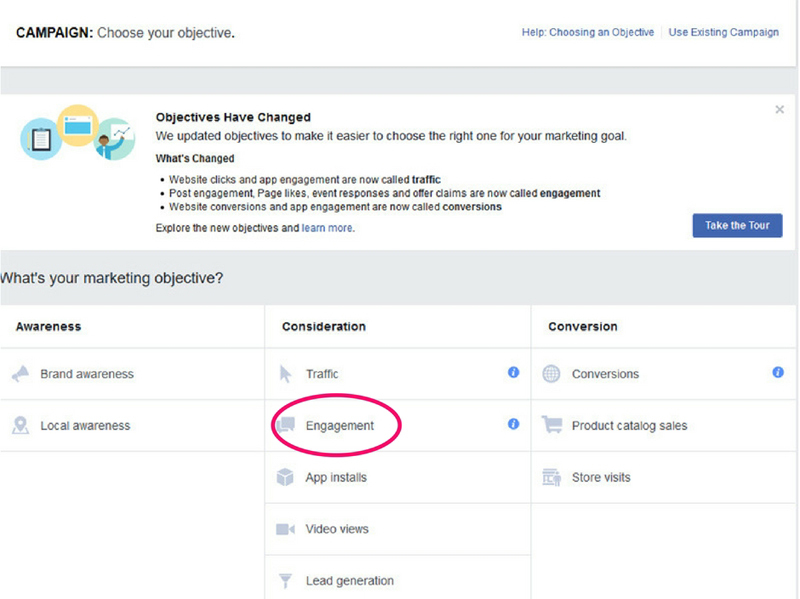 You want to choose “engagement” foe our purpose here. On the next screen, you’ll give your campaign a name. Next, it’s time to create your audience. Here, you’ll have to think who might be interested in your offer. I’m creating an ad for my gardening site, so I’m going to choose gardening and backyard for my audience. While backyard and gardening are what my audience is interested in, it’s too broad. I need to narrow this audience, and I chose to narrow it by making sure they are also homeowners. I chose this because I know most renters need to ask their landlord for permission to dig for a garden and I’d rather target those who can make that decision without asking for permission. Another example: let’s say you wan to target nurses. Choose nurses as your audience, but then narrow that large audience by adding nursing publications for example. This will ensure you have actual nurses, not just someone who is connected to a nurse (as a friend or family). 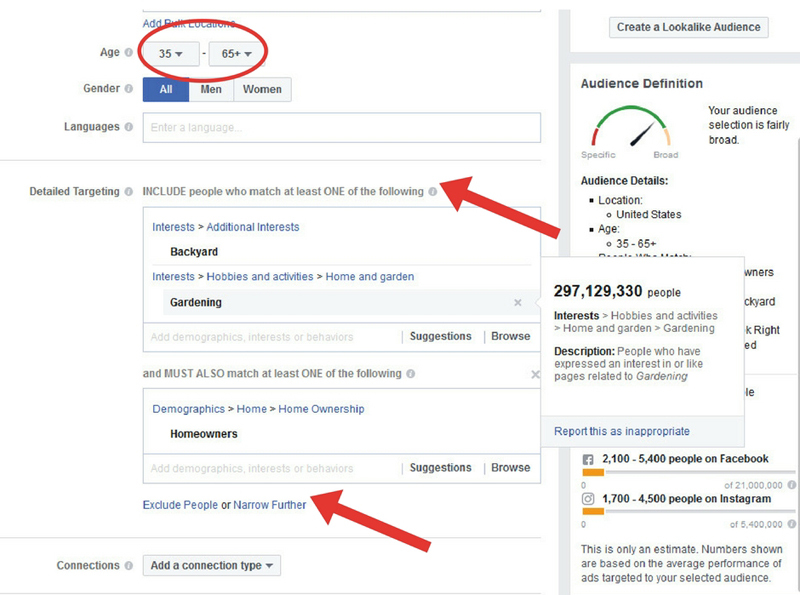 You also need to choose a gender (if your niche or specific offer warrants it), and an age for your audience. For my gardening page I decided to go with both men and women and chose 35 and up for age. For the ad targeting nurses, I’d probably choose age 25 to 60 and women. Or, if your offer was for men nurses, choose men instead. Again, just make sure you think through who is your final target, and narrow your audience down with that in mind. 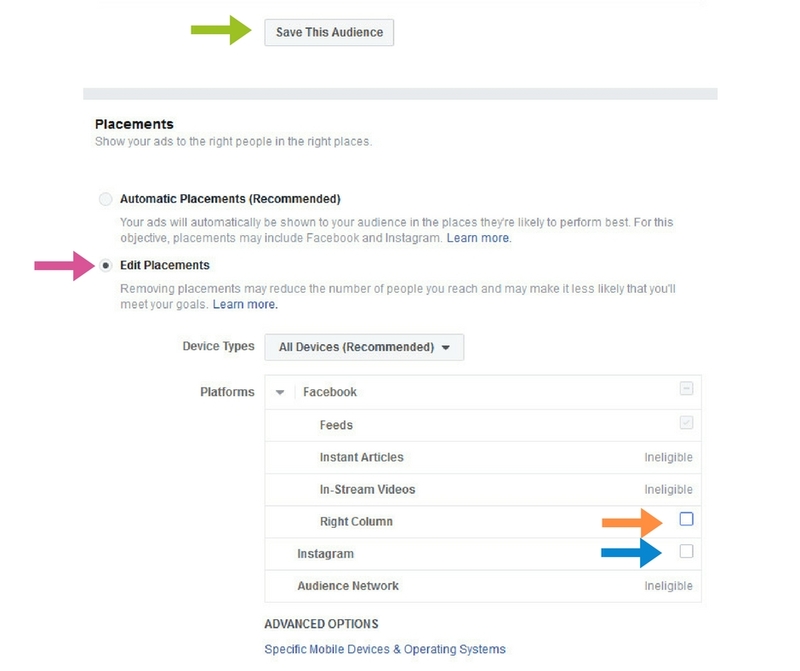 If you think you’ll use this same audience for several ads, you can save this audience so you don’t need to go through the steps each time, but instead choose the audience and go onto the next step. A little lower on this same screen, you can choose your ad’s placement. Many people leave it alone (FB recommends automatic placement), but I prefer to tweak mine. I don’t want my ads shown on Instagram, and I don’t want my ads shown in the right column on FB: I just want them in the FB feed. Now it’s time to set your budget and schedule. If you’re new to FB ads, I suggest you start with no more than $5/day. I usually only spend $1 to $3 a day for each ad (I have a few going). It will take up to 72 to hours for your click price to stabilize (especially if you only spend a dollar or two), so be patient. Do NOT stop and start your ad: every time you restart your ad, it goes back to the most expensive click first, and needs to stabilize again. 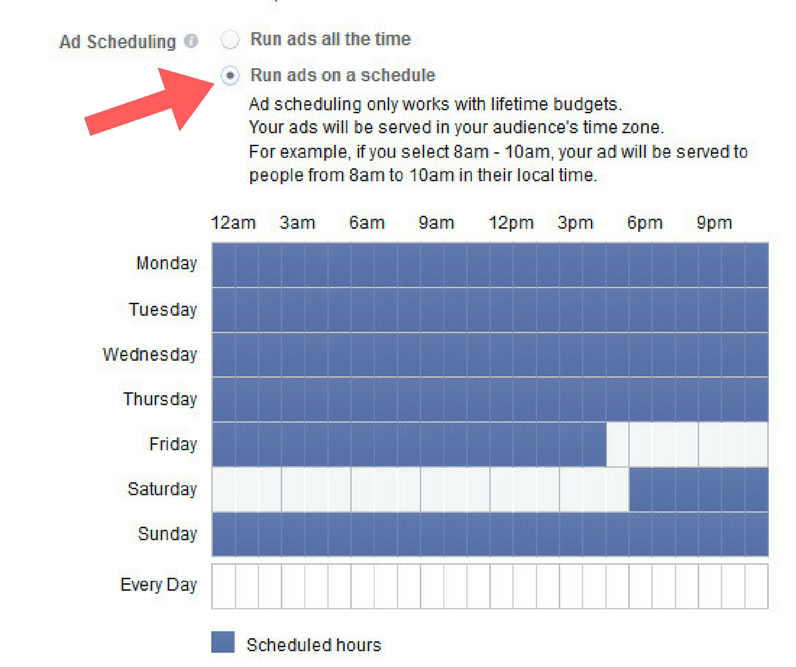 If, for some reason you want to schedule your ads at specific times of the day, you can do this by setting your budget to “lifetime budget” instead of daily budget” and then clicking on “run ads on a schedule”. Then, you can choose the times you want your ad to run. 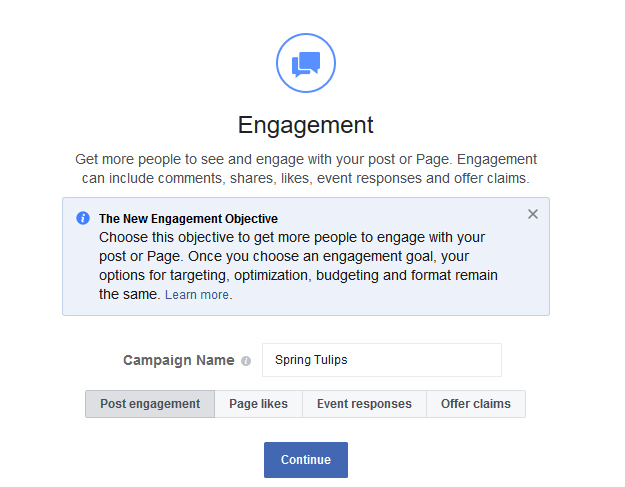 On the next screen, you’ll be able to choose the page (if you have more than one page) and post you want to boost. Again, it’s best if the post you want to boost already has some engagement: as you see, mine had 70 reactions (likes, loves, shares) and one comment. Click “place order” and you’re done. It could take up to 48 hours for your ad to be approved, but it’s usually a lot faster. My ad was approved instantly (not sure how they decide: sometimes it takes an hour or two for my ads to be approved, and other times they just get approved instantly, like now). You’re ready for traffic. Rinse and repeat. 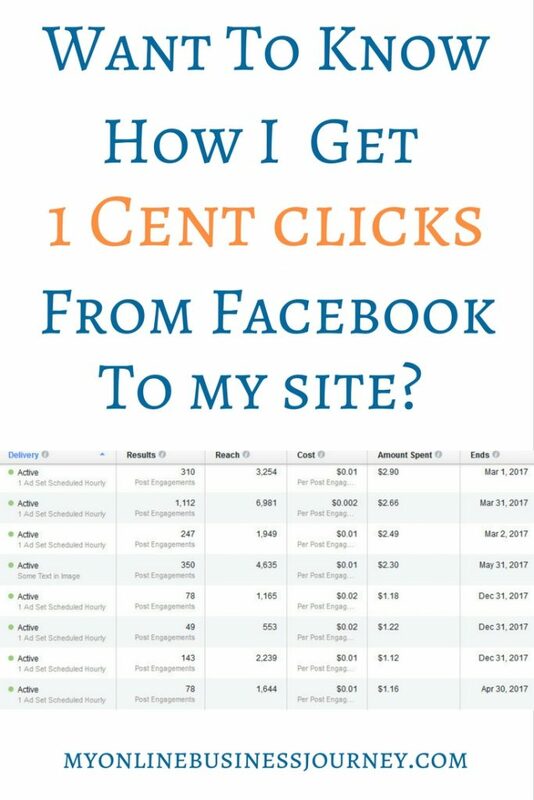 Once you get going with your FB ads, please come back and let me know how it’s going!